The first unit of this course begins by having students explore basic economic concepts such as production possibilities curves, scarcity, choice, and opportunity cost. The second half of the unit deals with different types of economies, including traditional, command, market and mixed, and also looks at key figures in economics like Adam Smith and Karl Marx. The second unit takes an in-depth look at the all important aspects and determinants of market demand, market supply, and market price. The laws of demand and supply are covered, as is the concept of price elasticity. In this unit, students learn through examples the role of production and costs. Production under perfect and imperfect competition is examined with topics such as profit maximization, monopolies, and oligopolies being covered in depth. Student close out the unit with an analysis of the market for labour, learning about demand and supply shifts, wages and other labour market issues. Now that students have learned the basics and have an understanding of microeconomics, they begin to explore large-scale economic phenomena. This unit sees students learning about GDP, including the expenditures and income approaches. They will also learn to calculate a country’s GDP. Other major topics such as unemployment and inflation are covered in detail. 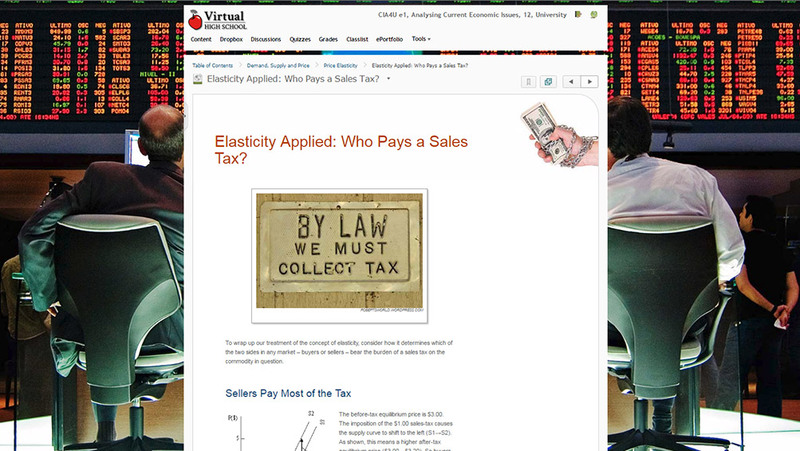 Students learn about economic fluctuations and fiscal policy in this unit. The aggregate demand and aggregate supply model is covered and students learn how to draw and use sketch-graphs to show how certain factors will affect the AD curve. The potential effects of shocks to the economic system, such as changes in government spending, changes in net exports, and changes in investment are also explored. The second half of the unit delves into fiscal policy. Both expansionary and contractionary fiscal policies are covered, and topics such as the multiplier effect, automatics stabilizers, and the pros and cons of fiscal policy are analyzed. This unit carefully examines three major topics: money, banks and the money creation/destruction process, and monetary policy. Students learn about the evolution and importance of money, the measurement of the money supply, and the money market. A thorough look at banks and the multi-bank system is then undertaken, and formulas for monetary expansion are learned. The last section of this unit sees students learning about central banks and monetary policy, as well as how this policy affects the real economy. In the last unit of the course, students learn about Canada as a trading nation, and the benefits and strains of international trade. Principles of International Trade Theory are explored, as are trade barriers and international trade policies. Balance of payments issues, the value of the Canadian dollar, and fluctuating exchange rates are examined in the second section of the unit, with students learning how to read foreign exchange rate tables. Lastly, economic growth is covered in the final section. The significance, measurement, and sources of economic growth are looked at in detail, and students also learn about topics such as promoting capital investment and technological progress. using a variety of methods of economic inquiry in order to explain past events and forecast trends.